Is A Ban On 'Ballot Selfies' Overkill? : It's All Politics A New Hampshire law designed to prevent voter fraud makes it a crime to post photos of completed ballots on the Internet. A lawsuit argues that it has a chilling effect on political speech. 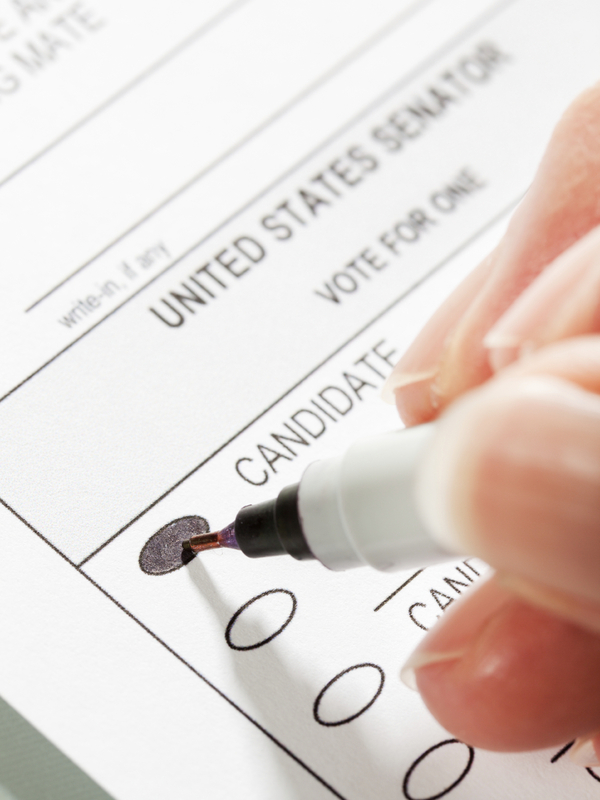 The act of photographing or sharing a filled-in ballot is illegal in 44 states. It started out as a seemingly harmless act: voters posting photos of their completed ballots on the Internet. One wrote in his deceased dog's name for senator because he didn't like any of the candidates, then shared his message of frustration on Facebook. A state legislator, and another a candidate for the state House, also publicly published photos of their ballots. Now they're under investigation by the New Hampshire attorney general's office. It turns out the act of photographing or sharing a marked ballot is illegal under state law — and in 43 other states. A "ballot selfie" risks a felony charge — and a $1,000 fine — in New Hampshire, where photographic images of ballots are banned in an attempt to deter vote buying and uphold the sanctity of the secret ballot. The rationale behind the law is that if a vote cannot be proved, it cannot be purchased. New Hampshire's law isn't just an awkward vestige from the past: The state actually updated the law this year to explicitly ban "taking a digital image or photograph of his or her ballot and distributing or sharing the image via social media or by any other means." The policy has sparked a lawsuit from the New Hampshire Civil Liberties Union on behalf of the three voters who posted ballot selfies. Gilles Bissonnette, one of two NHCLU attorneys on the case, said the new law is over-reaching and it's an infringement on the First Amendment. "The issue is the chilling effect this law has on people being able to engage in political speech outside the polling place," he said. "It is now prohibited one week, six months, one year later from publishing that ballot to engage in core political speech." But Dave Scanlan, New Hampshire's deputy secretary of state, said it's a necessary addition to prevent a new era of high-tech vote buying. "The law was updated as a preventative measure to keep the door closed on voter fraud," he said. "People coming out against it are not considering the issues that election administrators see with trying to make sure that the elections are free from voter fraud and that they're fair." Scanlan noted that the state has not prosecuted anyone under the new law for smartphone-enabled vote buying. "Before, the ballot and its image was given up to the state as soon as you stepped out of the booth and cast your ballot, but now people can keep that image and share it on the Internet." he said. "Were those votes bought? Probably not. But the statute as it stood before we updated it did not account for new technology and we're just trying to stay up to date to prevent fraud." Bissonnette said the idea behind the law was to cut vote buying at the knees by banning the display of a marked ballot, which would presumably exist in a vote-buying transaction. Still, he says, the law reaches far beyond that and bans the use of one's marked ballot in situations that have nothing to do with coercion. "It creates a chill on the type of speech we're encouraging. The law fails to recognize how powerful that photograph can be for social media," said Bissonnette. "It's about ensuring that the First Amendment continues to have relevancy in the 21st century."